It’s been almost 2 years since Jill was trained by one of New York’s top Dermatologists Neal Sadick on injecting the newest kind of collagen growing filler, Bellafill. Since then, Jill has become a Top Bellafill Injector in Minnesota and the Midwest. More importantly, our clients’ results have been outstanding! It has been thrilling to watch our client’s transformation as new collagen grows, volume increases and renewed skin appears. We invite you to come in and view our collection of before and after pictures. Jill can hardly hold back her excitement as she explains how Bellafill works. It is truly a unique product as a younger “you” emerges; results are natural looking AND your new youthful looks are long lasting. The collagen and new skin Bellafill produces are yours to keep. No more going back to baseline and doing it over again like a traditional filler the next year. Your investment to restore a youthful look to your most precious feature – your face is worth it! Jill is available Monday – Thursday 8:30 to 4. Contact us and let us know when it is a good time to come in and meet with Jill. The combination of sun exposure, genetics, gravity and aging leads to the loss of fat, collagen, muscle and bone. Returning volume to the face can make us look refreshed and less tired, without looking like we’ve had something “done”. My injection technique differs from many other cosmetic injectors. I prefer to use a blunt cannula when injecting volumizing fillers such as Bellafill and some Hyaluronic Acid fillers. A blunt cannula is a technique using a blunt, rounded, needle instead of a sharp needle to inject. The filler is still placed in the same locations; however, a blunt cannula is used to reach the areas needed to be treated. What is the advantage of using a blunt cannula? One insertion point treats multiple areas which to the patient equals less needle pokes for a more comfortable procedure. Safety is increased – cannulas don’t enter blood vessels as easily as a sharp needle. Bruising and swelling is decreased by over 90%. Areas around the eyes and around the lips that are known for bruising or swelling are able to be injected without any visible signs. Most people have less healing time and are more comfortable during the procedure. So why don’t all Injectors use a blunt cannula? Most Injectors are not trained on the technique or lack experience to be able to handle a cannula in their treatments. Cannulas are also much more expensive than the needle that comes packaged with the syringe of filler. My injection technique using the blunt cannula allows my patients to come in for injection and have a good chance leaving without any signs of the injection. Injectables, like medicine are a combination of art and science. The science is in the product and how it will respond in where it is placed. The art is in the skill and talent of your artist, the injector. I love being able to use my art degree daily in the work I love, sculpting faces. I enjoy showing clients my before and after pictures and talking about how fillers could help refresh a face. Reach out to me if you are interested in a consultation. EXTREME PROTECT SPF 30 provides extraordinary protection by combining broad-spectrum UVA/UVB protection and powerful antioxidants to mitigate oxidative solar damage. Featuring micro-fine zinc oxide and micro-encapsulated organic active sunscreens, EXTREME PROTECT SPF 30 offers advanced sun protection. This is a fabulous physical formula, 30 SPF. Glides on, leaves zero residue and leaves your skin feeling soft and moisturized. It’s great to wear under makeup and keeps the freckles away. How to use: Last step in the morning before makeup or by itself if you’re zooming out the door. Great to use on kids! Protect your skin all year long. Stop by or contact our clinic in Edina. No appointment needed! Are you tired of hearing how tired you look?? As I consult with my clients, one of the top concerns that almost always comes up is their desire to look more rested. Under-eye puffiness, bags, fine lines under the eyes…these are all are common complaints I hear from women. However, there is another concern that is coming up even more and that is under-eye hollows. Women who experience them say they feel like they look tired even when they aren’t. They are often asked the dreaded question “Are you tired today?” by multiple people throughout the day. Yes, topical products containing the ingredients caffeine, vitamin K, retinol and vitamin C, just to name a few can help to an extent with the appearance of the area. They do help with discoloration, increasing collagen, brightening the area and reducing puffiness, BUT when volume loss is the culprit for this less-than-desirable hollowed-out effect, fillers are the answer. 1. The fat pads that line this area separate and drop leaving the area with a hollow look. 2. There is also a loss (deterioration) of bone as we age leaving the face with less structural support. 3. The under eye skin area that is already thin begins to lose elastin and collagen support and begins to sag. Below is a picture of one of my clients who was experiencing fine lines, hollows under her eyes and was sporting a “very tired look”. I injected under her eyes with Vobella dermal filler and immediately her eyes looked more refreshed and younger. She did not have any swelling or bruising and was very pleased with her natural looking fix for her tired looking eyes. Vobella is new to the market and is a softer hyaluronic acid filler that lasts approximately a year. I also frequently inject Bellafill (the five year filler that grows your own collagen) under the eyes with the same beautiful results. I believe dermal fillers under the eyes produce fabulous results, but I do caution patients to only seek out healthcare professionals who have appropriate training, experience, and knowledge of facial anatomy. (I have seen the consequences of patients seeing an inexperienced injector). It is always best to have a consultation first to determine which dermal filler (there are many different kinds on the market) would be best for you and the area you want treated. I would be happy to meet with you and help you to achieve the results you desire. You can call the clinic at (952)922-2345 or contact me here. 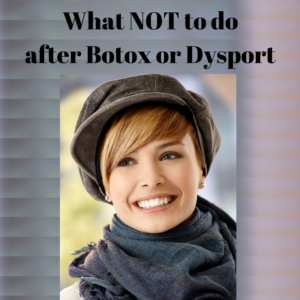 To ensure you get the best possible results after your wrinkle fighting treatment here are some things you should and should not do before and after you get Botox or Dysport. Botox and Dysport are most often used on forehead lines, crow’s feet (lines around the eye) and frown lines. First and foremost select an experienced provider – Choosing a provider who knows and understands the anatomy of the face and has several years of experience injecting is very important. Good results depend on the skill and technique of the injector, so do your research. Discuss your ideal results – Talk to your provider about what areas bother you. Botox and Dysport injections are customizable varying by how much muscle movement you desire. In addition, there may be a different treatment better suited for the area you want treated. Stop taking medications that can thin the blood 4 days prior to treatment to minimize potential bruising. Taking Tylenol for pain medication is okay. Start taking Arnica tablets if you bruise easily 4 days prior. Arnica pills (not gel) can help prevent bruising. Follow the label instructions continue use for 2 days after injections. Do not touch the area injected until injection sites have closed. You can gently cleanse your face before bed but blot dry, do not rub dry with a towel. * Do not rub or massage the treated area for 24 hours. Avoid getting a massage or facial as well. * Do not lay down for 4 hours after treatment. * Avoid strenuous physical activity especially jumping up and down day of injections. * Do not wear a hat. You want to avoid having anything pushing down on the forehead if treated there. * Avoid a jacuzzi, hot tub or sauna as the heat can cause the Botox / Dysport to spread. Over-use your muscles the day of injections. Making a lot of facial expressions will work the Botox and Dysport into your muscle. Avoid alcohol for 24 hours after treatment. If you get a bruise, topical arnica gel or vitamin K gel can help to make it go away faster. Full results typically take 10-14 days. A touch-up may be needed to tweak your results. Wait until at least 10 days to contact your provider. Reviewing this list before receiving a Botox or Dysport injection will improve your experience and help to ensure you receive the best results. Our Nurse Injectors always offer free Botox consultations and check-in visits. If you would like to see if a Botox/Dysport treatment will give you the results you desire, give us a call at (952)922-2345 and chat over the phone or make an appointment. 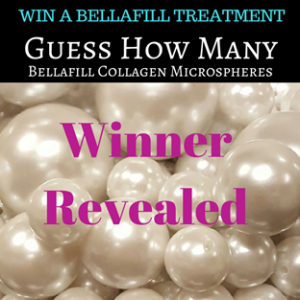 Congratulations LINDA WONG, winner of the $800 Bellafill Treatment in our ‘Guess How Many Collagen Microspheres contest’! She guessed 250, the lucky number was 261. Thanks to everyone who participated! Did you know that with Bellafill, the body is able to reverse backwards and re-grow lost tissue which is the actual cause of the aging face? Although temporary fillers provide beautiful results, they are simply are not effective in the long run. The hyaluronic acid is absorbed by the body and requires repeated injections to maintain the benefit. Bellafill is not absorbed into the body due its unique patented microspheres. The beads act as a bio-stimulant simulating your cells to make new tissue and collagen creating a longer lasting and natural method of reducing wrinkles. 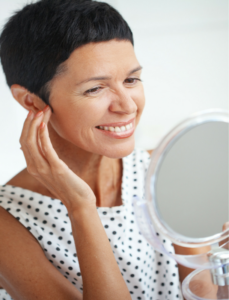 Formal FDA studies have shown that Bellafill will last at least 5 years. Bellafill is extremely safe and well tested. It is the only FDA approved “permanent” filler. In essence, patients “own” their new youthful looks rather than renting them as with temporary dermal fillers. While Bellafill’s effect does not last forever due to the natural aging process, it continues to be a strong structural base to build upon. Our Nurse, Jill has worked a lot with Bellafill and is one of the top 1% providers in the US. She would be happy to answer any questions or concerns you may have about this treatment. Contact Jill.